In 1995, a friend introduced Julliette to a pair of turntables. That introduction inevitably marked the beginning of her DJ career and changed the course of her life. Julliette quickly became, and remains one of the most recognized, talented and respected DJs in Utah. Passion, integrity and untamed talent lead the way to Julliette’s many achievements. Known for her bass driven events and signature sound behind the decks, she was a powerful force in the Utah Drum & Bass scene during the late 90’s. 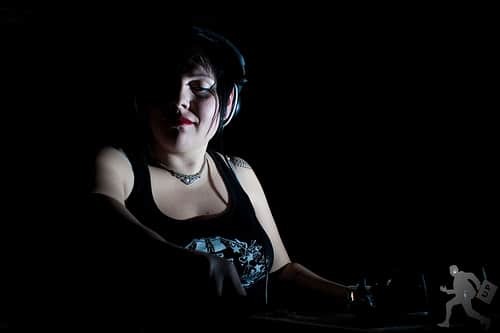 Julliette was voted the #1 Junglist in Utah by the Vibe listeners’ poll for two years running, the second-place finalist in the 1st Annual Defcon Deejay battle, and is one of the top booked DJ’s in Utah. Julliette has performed at hundreds of clubs and events across the U.S., many with audiences averaging 3,000 or more. Additionally, she has held down multiple full time and rotating club residencies throughout her career. Julliette primarily spins broken beat genres, especially Drum & Bass. You may hear her spin some house once in a blue moon.